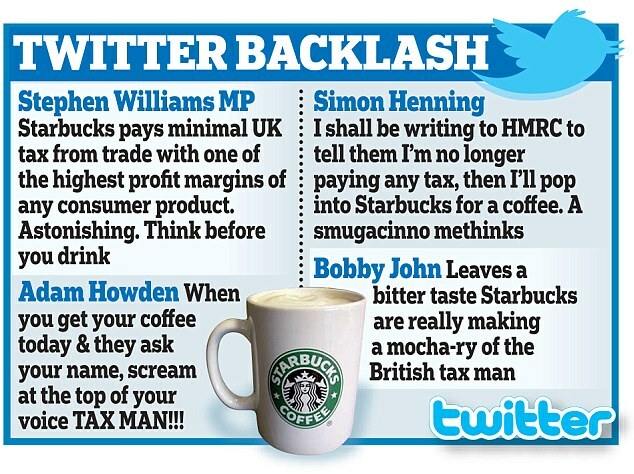 The still-rumbing Starbucks tax scandal in the UK, prompted by an initial Reuters report on the subject, has had a massive impact, with endless news stories, editorials, television broadcasts, radio discussions, big protests, and outrage from politicians and the general public. Pollster YouGov said its BrandIndex survey of 2,000 people showed a drop in Starbucks' reputation score to -26 before the Reuters story, from +3. All this attention is welcome, and long overdue. Britain remains committed to a race to the bottom on international tax. British politicians on left and right continue to act in the interests of their own paymasters, via a series of revolving doors and party financing: big multinational corporations and especially the City of London. British politics has been thoroughly corrupted by this race to the bottom: politicians quail in the face of threats by multinationals and their supporters in the accountancy professions, who cry "don't tax us too much or we will run away!" Really? In the real world, Starbucks has been making huge profits in the UK: there is no way at all they would jump ship on account of five more pence on the rate of corporation tax. Raise corporation tax rates significantly (and here's one huge reason why you really should, and urgently) and Starbucks will still be making stonking after-tax profits. What's to walk away from? For an account of the race to the bottom, with an ugly peek into policy-making in the UK, take a look at this. But for those who don't want to wade through the website and all its links, we'll include a section from a Tax Research blog, edited by us, which offers key pointers as to the way ahead. It's UK-focused, but it has international relevance. First, the political mood music on corporate tax has to change. We have reached the absurd point where politicians have joined in the race to bottom in international tax regulation that began in tax havens and was first promoted by lawyers, accountants and bankers. Surely we should expect politicians to stand up for the states we vote them to run? And yet now they don't. We have current politicians in the UK who pride themselves on having abandoned our residence basis of tax so suitable to a country that hosts large numbers of parent companies. Instead they promote the whole notion of turning a blind eye to what happens outside the UK by adopting a territorial basis of tax that only taxes income arising in the UK, and asks few questions of how that income arising is determined. Second, obviously, we need to invest much more heavily in collecting tax. There are only 2,000 or so fully qualified tax inspectors in the UK. That is ridiculously few. And let's recall that total staff in HMRC will have fallen from 100,000 in 2005 to 55,000 in 2015. More high quality, highly paid staff to challenge abuse by the largest corporations is vital. Right now companies and their lawyers are running rings round the Revenue. Third, we must uphold existing law. We aren't doing enough to challenge the whole structuring of some deals. The law to let us do much of this exists, but we can only do it with a properly resourced and staffed Revenue authority. Cuts to the Revenue services directly increase fiscal deficits. Fourth, The OECD arm's length pricing method of transfer pricing does not work - and everyone in this field knows it. The FT has promoted the unitary model of taxation this week that I and others in the Tax Justice Network have long promoted. This is a particularly promising avenue to explore, and essentially it involves moving away from the current system - where multinationals are taxed according to the artificial legal forms that their accountants cook up for them - and towards a system where they are taxed according to the real economic substance of what they do. This allocates group profit to countries using a formula based on where the destination of sales is, where people are employed and where real physical assets are. 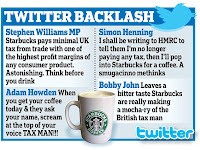 So (to over-simplify) if Starbucks has six percent of its coffee sales, employees and assets in the UK, then you take Starbucks' total global profits and allocate six percent of that to the UK, to tax at whatever rate it likes. This approach has an ugly name - "unitary taxation with formula apportionment," (though 'unitary tax' is more palatable) - and it works: for instance, a growing number of U.S. states are using it, for state-level taxes. For more on this, see our short section on unitary tax on our transfer pricing site; see this (outdated, but still very readable and entirely useful) primer on unitary tax, and a more detailed presentation here; and more wonkish readers might like to look at Michael McIntyre's more academic exploration of how this all works in the United States. This reform is now essential if we are to demand that global capital is to be accountable locally for tax. Fifth, we have to be honest about the scale of the problem. Not a penny of the abuse the press and parliament are rightly worried about is in the HMRC tax gap figure. That's ludicrous. It suggests that they and their political masters are in denial about what is happening. An honest assessment of the tax gap and what should be in it is vital. Sixth, our politicians have to go to the EU and argue that we must have change on the lines I have outlined above [see the first part of the original blog for a detailed look at the EU-related issues: essentially, what happens technically within the letter of the law but is abusive can be challenged]: I believe we can demand that the EU Code of Conduct be revisited, and we now must demand that the idea of the abuse of law in these cases must be tested. Last, but by no means least, we must have country by country reporting in accounting as well. We have to know where corporations are and what they do, and how much tax they pay in each and every country in which they trade. Nothing else will also hold companies to account – and force them to change their behaviour under the glare of pubic, investor and regulator (including tax inspector) scrutiny. Political will is the first prerequisite for change, but political will has to be built on a basis of solutions. We hope this starter pack can help focus some minds. A final note. Ellie Mae O'Hagan writes in the Guardian today about her experiences campaigning on these issues with the protest group UK Uncut. "If there's one thing UK Uncut has taught me it's that campaigning is sometimes inconvenient, and it takes time to see results. I remember the first time I met someone from the Tax Justice Network: he talked to me about campaigns in terms of decades, rather than months. In an age of ultra-convenience, it was a shock – and, I felt, an injustice – to have to wait that long for something I wanted. But what I realise now is that the continuing presence of tax avoidance isn't a sign that UK Uncut has failed: it's a sign that the campaign isn't yet finished." We should add that this was a conversation between TJN's John Christensen and Ellie Mae on the steps of Top Shop on Oxford Street in London. And quite so. We're in this for the long haul.